Looking for London chauffeur-driven car service ? Here you can find a list for chauffeur driven car hire services. 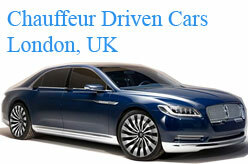 Hire Chauffeur Driven Cars in London. List of Chauffeur Driven Car services in London, England, UK. – London Chauffeur Service & Executive Car Hire. iChauffeur offer executive luxury chauffeur driven car hire services in London & the UK for business, airport transfers & special occasions. – Maxwell chauffeur driven car hire provides services at competitive rates. Services includes airport transfers from Heathrow or Gatwick, conferences, business meetings, London and UK sightseeing tours, nights out in London and more. – London Prestige Chauffeur Services is a seasoned Chauffeur Company in London which aims to offer you more than just a ride in a hired car. Services are Airport/Seaport Transfers, Corporate & Road Shows, Tour & Sightseeing, Theatres & Nights Out, Weddings, Sporting Events. – Providing you with stress-free, dependable and safe luxury travel. services are Airport Transfers, Rail Station Transfers, Hourly Services, Business Itineraries, Dinner & Theatre Hires, Financial Roadshows, Corporate Events and Sporting Events. Sovereign Car Hire Services Ltd.
– Offers “London Airport Chauffeur Service”, “Wedding Chauffeur Hire In London”, “London Corporate Chauffeur Service”, “Personal Chauffeur In London”, “Chauffeur Car Service For Special Occasions”, “Diplomatic Chauffeur Services”, “London Theatre Chauffeur”, “Chauffeur Driven Tours In London”. – Offer a professional chauffeur services in London, Essex & the rest of the United Kingdom. Chauffeur car hire services for private hire and airport transfers in London and around the UK. Comfort Executive is a wholly owned subsidiary of CityFleet Networks Limited, who operate bus, coach, car and taxi services all across the UK and Ireland. S-Class Chauffeur Services Ltd offers a complete range of luxury chauffeur-driven service options in London, the south east and Kent.